If there is one thing as a nation we have become acutely aware of it is the importance of preserving out national heritage, and whilst some of the buildings may not be carrying out their original function, the fact that they still exist at all gives us a chance to glimpse into the portals of the past and marvel at their grandeur and the role they played! One such building stands in a busy location in Central London at Southwark, once the epicentre of the London brewing industry - The Hop Exchange. Whilst people pass to and fro and the traffic roars up and down Southwark Street few notice the ornate Victorian building that was clearly built as a statement of the importance of London as the brewing capital, and the dominance Southwark in particular played in the raw material supply chain. Southwark has a long historical connection with brewing dating back to before the time of Chaucer's writings in 1387 when its Inn's supplied the pilgrims on their long journey to Canterbury. Many a pilgrim was worse for ware having indulged in the heady ales of Southwark and becoming 'dronke' before undertaking the trek! The abundance of Inn's, and most importantly Coaching Inn's in Southwark came about as up until 1750 the only land crossing across the Thames into the city was via the Old London Bridge which extended from Borough High Street. All road traffic from Surrey, Sussex, and most importantly Kent had to pass through Southwark which made it the ideal location for the hop industry to establish itself.. It became the commercial hub of the London brewing trade, particularly during the Victorian era, with no less than four brewers in close proximity. Two Noakes & Co. and Jenners may largely be forgotten, but Barclay Perkins and John Courage were celebrated at the time as two of the largest and most impressive in the capital. Such brewers were the must see tourist attractions of the day, particularly Barclay Perkins who would receive over 50,000 visitors over a five month period during The Great Exhibition of 1851! The journey of the hop, from the fields to the brewery, would require them to pass through several hands. Initially the picking of the hops themselves (a paid working holiday for many a poor East End family) were dried in the Oast Houses and packed into 'pockets'. These were jute sacks weighing one hundred and a half hundredweight, some 12 stone, or 72.6 kg. They would then make their way to the 'Factors' the middlemen, who charged a grower commission and would store them in their own warehouses. The hop 'Merchant' would then select the hops on behalf of their brewing customers, who in turn would charge the brewers commission for their services. 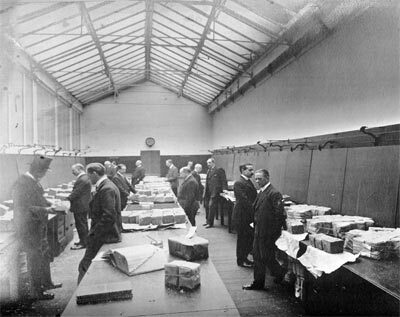 The Factors had their own warehouses in Southwark (some capable of holding some 10,000 pockets) and potential buyers were invited to their showrooms to inspect samples which were cut in to 1lb. ( 0.45kg) blocks. Natural light (as can be seen by the glass roof in fig.1) was the prime requisite for inspection. This then was the established order of events over many years. Southwark then was then alive with the activity of the hop industry, and the fascinating picture above from 1837 (fig.2) shows the vibrancy of the High Street, with heavily laden carts and pockets moving in all directions. Fig. 1 A Factors showroom with glass roof above. Fig. 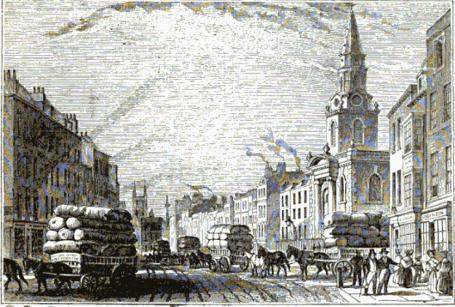 2 Borough High Street in 1837 with carts laden with 'Pockets'. What is known as The Hop Exchange today was designed by R. H. Moore in 1866 as a speculative project in the belief that the factors would benefit from working in a single environment and an impressive trading hall, reflecting the grandeur and importance of the trade itself. 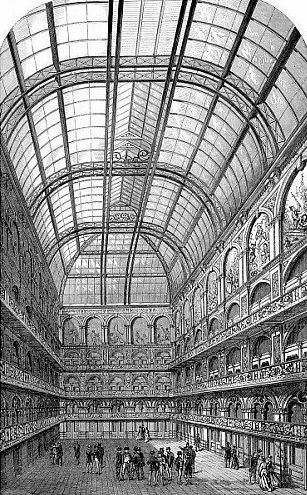 The building was originally of a five level height , reminiscent of a Colosseum fashion, with a large domed glass roof which would allow optimum light for the traders. 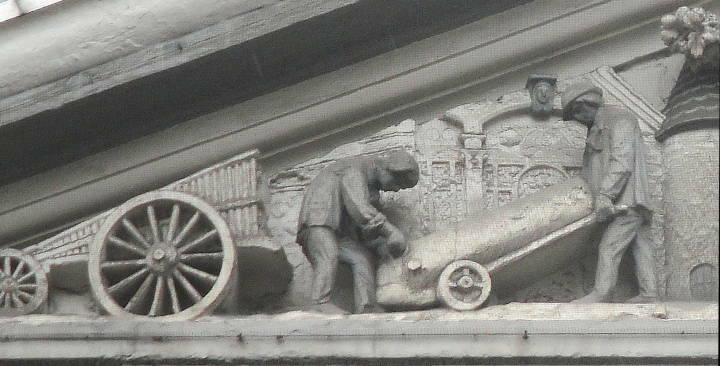 What is not generally known is that the building was originally called 'The Hop and Malt Exchange' and the highly decorative tympanum over the top of the entrance gives this away, as the relief does not just show the hop pickers at various stages of the process, but to the right a farm worker in the field among the ripened barley with a scythe in hand. It then reflected the two most important raw materials in the brewing process. 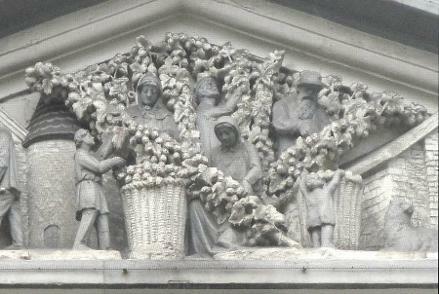 The overview of the tympanum ( top left) of the exchange with hop scenes above and to the left. Above clearly shows the importance of the barley in the field which would become the malt for brewing... the exchanges other purpose. 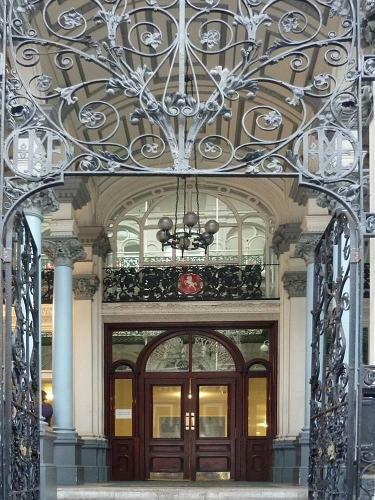 The trading floor itself has stunning balconies with iron work on each level of hops decoratively entwined, and also the coat of arms of the 'County of Kent' appears liberally - clearly stating the importance Kent played in hop production during the Victorian era. The entrance too has elaborate hop iron filagry climbing high from floor level, and again entwined with ripe hop cones in abundance. This is imposing and almost fortress like as it is grandiose, announcing you are entering something altogether majestic. The entrance to the exchange left and above the trading hall. The coat of arms for the County of Kent can be seen on the ornate galleries. THE 20TH CENTURY, SPECULATION... AND BEYOND? On the 20th October 1920 disaster struck the exchange and fire destroyed two of the upper stories and the glass dome collapsed. Three levels were saved and in recent years the entire building has undergone careful restoration, and is still imposing. The Factors warehouses in Southwark too were also hit hard during World War Two, when 25 out of the 37 built were destroyed by German bombing, but the trade rallied once more. Ironically it would turn out that for all its good intentions the exchange never really fulfilled its original purpose. The Factors themselves had their own showrooms in Southwark, so therefore did not need a central venue to sell their wares. Various associated trades would use the offices over time, but it never fully captured the imagination as envisaged . The exchange was, after all, built as a speculation which sadly misjudged the needs of the industry it was attempting to represent. Nevertheless on a different level the exchange confirmed Southwark's preeminence as the brewing centre of the capital. 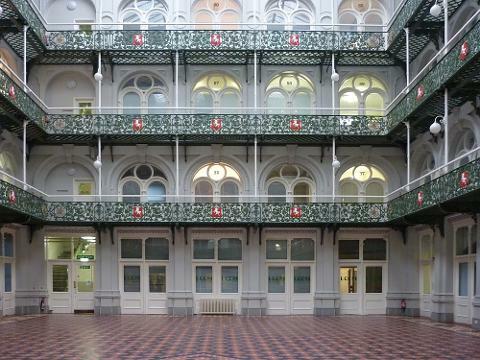 Today the building still looks stunningly impressive and is privately owned rented out for offices, corporate events and functions. 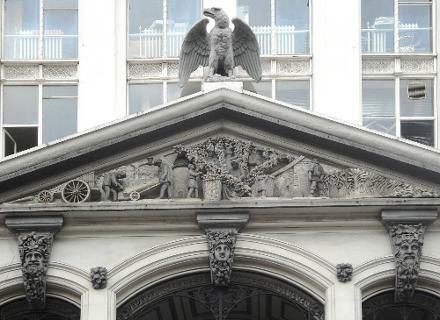 London has long been in need of a museum to recognize its brewing heritage, and the location and historical connection to the trade would make The Hop Exchange an ideal venue. It would then take the building full circle, returning a small section to the trade it was once designed to represent, but in an even broader context. A London Museum of Brewing would once again be a must see attraction in the Capital, and ironically would be located only a few streets away from the Barclay Perkins Brewery site that back in 1851 was the star attraction!